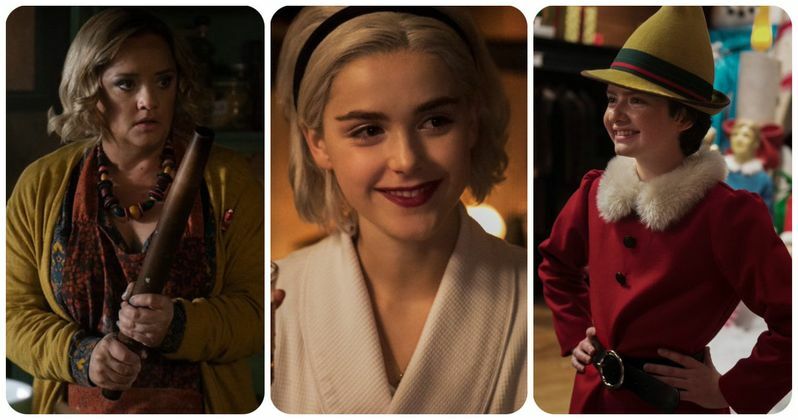 If you were one of the many people to enjoy the new Chilling Adventures of Sabrina series on Netflix, you're not alone. The show has proven to be a critical hit for the streaming service, sitting on a 90% fresh rating at Rotten Tomatoes. Consisting of ten episodes, many fans were able to quickly watch through the entire first season, and already eager to see more. While we can expect a second season to hit Netflix in the future, a special Christmas episode will be premiering on the service next month. Better yet, several first look photos of the new episode have been released by Netflix and are now online! Set to stream on Netflix starting Dec. 14, the holiday episode is called A Midwinter's Tale. It will be set during the Church of Night's celebration of the winter solstice. It's very much in line with the series, as it will have families celebrating by singing pagan carols and telling ghost stories around the fire. Netflix is also teasing that a certain someone just might be coming down the chimney in the episode as well, but it might not be who we're all thinking. As a standalone episode, the plot will center mostly on the winter solstice, but the storyline is a part of the continuity and will affect the upcoming second season. Based on the comic book series with the same title, Chilling Adventures of Sabrina first hit Netflix at the end of last month. The show was originally developed for The CW as a companion series to Riverdale, with the idea of sharing a continuity. Netflix later picked up the series with a two-season order, although they have yet to reveal the release date for Season 2. Because the seasons were filmed back to back, we should hopefully not be waiting for too long to see the new episodes. Giving fans a holiday special in the meantime will help hold people over. After its release, Chilling Adventures of Sabrina became the subject of a Satanic Temple lawsuit against the series. Members of the church were apparently none too pleased with the show's depiction of their Baphomet statue. According to the complaint, Netflix and Warner Bros. are being accused of using the statue without permission for the series. The church is seeking damages worth $50 million, claiming the iconic goat statue appears in four separate episodes of the first season. In addition to showing Baphomet, the Satanic Temple is also unhappy with the way its members are portrayed, unwilling to be associated with the "evil antagonists" on the show. With or without controversy, the series will be moving forward. "A Midwinter's Tale" will be premiering on Netflix on Dec. 14, with Season 2 likely arriving sometime in 2019. It seems probably we won't be seeing the Baphomet statue again, however. You can take a look at what to expect from the holiday episode by checking out the photos below. These pictures come to us from Netflix.